SUCELLOG project has been officially concluded on 31st of March, 2017. We thank all our cooperation partners and stakeholders for the continuous interest and contributions to SUCELLOG project activities! The European Feed Manufacturers' Federation (FEFAC) was founded in 1959 by five national compound feed associations from France, Belgium, Germany, Italy and the Netherlands. FEFAC membership today consists of 24 national associations in 23 EU Member States as full members as well as Associations in Switzerland, Turkey, Norway, Serbia and Russia with observer/associate member status. FEFAC is the only independent spokesman of the European Compound Feed Industry at the level of the European Institutions. On 20th of March, 2017 WIP had a bilateral meeting with the Deputy Secretary General of FEFAC. The meeting took place in Brussels at the office of FEFAC. 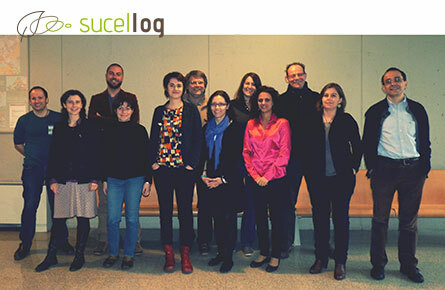 The aim of the meeting was to present the concept of SUCELLOG project, to inform about lessons learned during auditing studies implemented in project countries and with biomass resources available for feed producers, and to discuss further cooperation opportunities in dissemination of SUCELLOG project results. Greece to agriculture members of INASO-PASEGES (the organisation providing technical support to the PASEGES-Pan-Hellenic Confederation of Unions of Agricultural Co-operatives). Portugal to agriculture members of CONFAGRI (Confederação Nacional das Cooperativas Agrícolas e do Crédito Agrícola de Portugal). Croatia to agriculture members of HPK (Croatian Chamber of Agriculture) and energy stakeholders from EIHP (Energy Institute Hrvoje Pozar). A visit to the Austrian logistic centre developed within SUCELLOG support was carried out. On the 25th of January, 2017 SUCELLOG project was represented at the meeting of experts organised by the European Biomass Association (AEBIOM) in Brussels. Members and non-members of AEBIOM as well as experts and other economic operators have been invited to this workshop to discuss pressing issues and joint actions that may contribute to the uptake of the use of agricultural biomass and energy crops. SUCELLOG project was present at the 82. International Green Week (IGW) that took place in Berlin, Germany from 20-29th of January, 2017. SUCELLOG project was a part of the nature.tec stand. The IGW has been used as a platform for the dissemination of SUCELLOG project activities and results, and to meet with the project target groups. IOC – International Olive Council – is the world’s only international intergovernmental organization in the field of olive oil and table olives. The Council is a decisive player in contributing to the sustainable and responsible development of olive growing and it serves as a world forum for discussing policymaking issues and tackling present and future challenges. 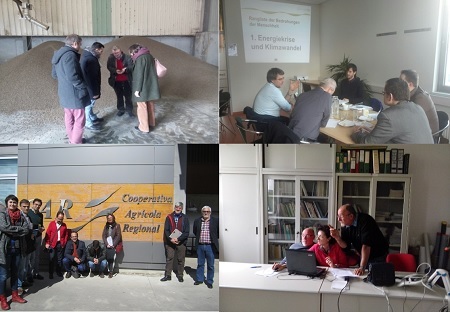 On 16th of January, 2017 Spanish Cooperatives had meeting with the IOC to present the concept of SUCELLOG project, to inform about lessons learned during auditing studies implemented in project countries regarding the use of olive biomass for energy production and to discuss further cooperation opportunities in dissemination of SUCELLOG project results to the members of the association. CEEV – Comité Européen des Entreprises Vins – is a key European professional platform which leads the dialogue and coordination in the combined European and international wine sector. CEEV is the voice of the EU Wine Companies and leads successful dialogue and advocacy of the EU Wine sector towards the European and international institutions in all policy areas affecting the Wine business. On 18th of November, 2016 a meeting with the Policy Officer of CEEV has been organised. In this meeting the concept of SUCELLOG project and several examples of biomass supply chains regarding utilisation of wine pruning residues in SUCELLOG project countries have been presented. Further opportunites for the cooperation between SUCELLOG and CEEV on the dissemination of the project results have been discussed. 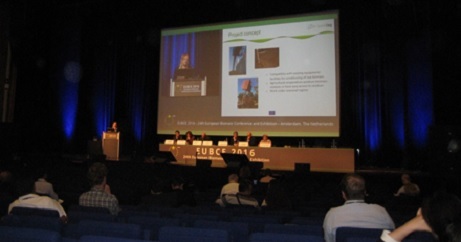 SUCELLOG was presented on 24th EUBCE during the session 1BO.9 – Mobilisation of biomass for energy use. WIP Renewable Energies presented the concept of the project and results of feasibility studies and business plans of two SUCCELOG cooperation partners – Spain and Austria. Around 60 participants attended this session. The CIDE, Commission Intersyndicale des Déshydrateurs Européens (European Dehydrators' Working Group) was set up in the 1950s and is a non-profit association governed by Belgian law. The members of the CIDE are national associations of fodder processors, dehydrators and also processors of sun-dried products. SUCELLOG project concept has been presented on 2nd of June, 2016 in Brussels on the occasion of the meeting of CIDE Board of Directors. During the presentation the opportunities for alfalfa drying facilities for replication of the concept developed in the project has been stressed. The equipment used for alfalfa processing is highly compatible for biofuels production lines. In addition two case studies of SUCELLOG project have been presented, one of them being alfalfa drying facility in Spain – cooperation partner of the project. One of the key goals of SUCELLOG project is to build-up skills in the agrarian sector about solid biomass production issues. For this reason regional agrarian associations have received specific training on how to make a techno-economic feasibility study of an agro-industry willing to become a biomass logistic centre. For more information about trainings, please download "Report on the training sessions in the participating countries" which is available on the "Publications & reports" section of SUCELLOG project website. SUCELLOG has been presented at the 39th International Fair on Agricultural Machinery (FIMA) which has been held in Zaragoza the 16-20 February 2016. The FIMA is a key event in Europe for the agro-industrial sector. CIRCE presented the actions and results achieved so far as well as the services available for the agro-industries to promote the sustainable construction of agro-industry logistic centres. Download the presentation. on the 12th of January 2016 in Rome (Lazio), a workshop of the Project SUCELLOG was held within the National Directorate of Legacoop Agroalimentare, at the headquarters of Via Giuseppe Antonio Guattani, 9.the focus of the interventions were the opportunities for SMEs/Cooperatives by European funding programmes on specific issues, an example of which is the project SUCELLOG. During the meeting, the project and its activities were shown. In particular, the opportunity for agro-industries to become a logistic center for the production of biomass from agricultural residues was shown. Download the presentation. Services Coop de France presented SUCELLOG on the 4th of December in the Galery of the COP 21, the united nations conference on climate change. This offered the opportunity to present this innovative project to industrial companies and French representatives. SUCELLOG participated in the Workshop organised by COPA-COGECA "What instruments/tools to develop logistics for the agriculture and forestry biomass supply chain" on 16 Novemeber 2015 in Brussels. Download the workshop programme. how to use landscape maintenance hay, straw, corn cobs, husks etc as raw material. For more information please dowload the invitation. At the annual fair ECOMONDO, held in Rimini from 3rd to 6th November 2015, D.R.E.Am. Italia was present within the area of Cooperambiente, exposure on the supply of energy and environment services to cooperatives (made in collaboration between Rimini Fiera and Legacoop), for the dissemination of the SUCELLOG project, with material and personnel available to provide clarification on the activities and the technical support offered by the project. Download the presentation. WIP Renewable energies presented the SUCCELLOG project in a dedicated slot. More than 1300 participants from the whole biomass supply chain were present in the event. Download the presentation. For more information visit the EUBCE website. On the 24th of February, CIRCE presented SUCELLOG inside the Energy and Environment International Trade Fair which took place in Madrid. CIRCE informed about the project concept and achievements in a special event dedicated to discuss with stakeholders about the situation of the bioenergy sector in Spain. Download the presentation. SUCELLOG project was presented in “Conecta BioENERGÍA-Solutions for the Food and Farming Industries” inside the International Fair of Expobioenergía. The International Fair of Expobioenergía, which is celebrated every year in Valladolid (Spain), gathers most important professionals of the bioenergy sector from 20 countries and in 2014, it dedicated a special event for agro-industries. The presentation of SUCELLOG was carried out by CIRCE on Wednesday 22nd of October inside an event whose goal is to foster the use of bioenergy inside the agroindustry sector to cover heat demands. Download the presentation. 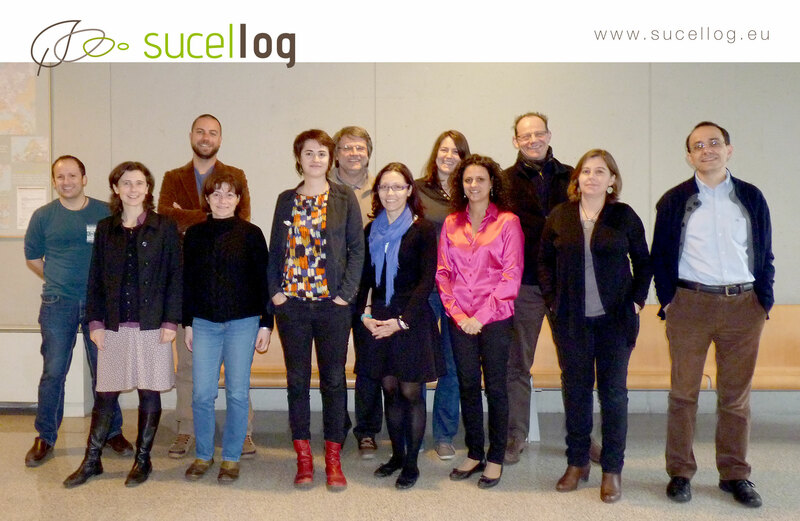 The Kick-off-meeting of the SUCELLOG project took place on 2-3 April 2014 in Zaragoza, Spain. Under the coordination of CIRCE, the consortium planned the work programme for the upcoming three project years and focused on the work of the upcoming 6 months. The Kick-off-meeting is an internal meeting for the consortium only.